Every day is a new day. I’m really learning to take each day at a time. It’s so easy to compare my story to someone else’s. Especially when it comes to milk volume. I definitely have to work at my supply. Milk tea at night. Oats in the morning. Frequent pumping during the day. Occasionally pumping before bed. And yet my daughter has always had enough. She’s nine months old and eating EVERYTHING in sight. She loves fruits, vegetables, chicken, pork, rice, pasta, yogurt, and cheese. She will eat lemons and pickles and not bat an eye. She’s growing like a weed and constantly needing longer pants. I watch her for how my milk supply is doing and the milk I pump is based on her needs. I do think it’s important to normalize pumping, though. It is important for women to feel empowered that their body is making good nutrition for their baby. 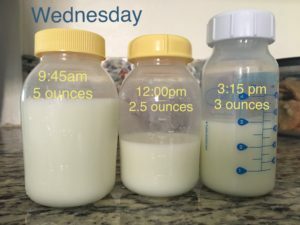 It’s important to know your baby and know if he or she is getting enough milk. In the first two weeks of life, babies should eat 10+ times per day. Babies need to regain their birth weight by 2 weeks of age. This is a really good indication that the baby is getting the calories they need. The average baby gains 1 ounce per day until 3-4 months of life and an average of 1/2 an ounce a day after that. Wet and dirty diapers are also a good indication of milk intake. On day one of life they should make one wet diaper, on day two they should have two wet diapers. 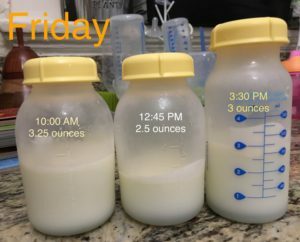 On day three they should make three wet diapers. 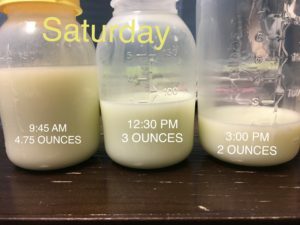 This pattern continues until day 5 when they should start making 6-8 wet diapers a day. *Addendum; I realized I should note, this is not all the milk my daughter gets in a day. She breastfeeds directly from me when she wakes in the morning, when I get home from work, around bed time, and usually still once or twice at night. This pumped milk is what she takes while I’m gone at work. Sometimes she will take more than what I’ve pumped the day before. My husband will take a packet of frozen milk out of the freezer for her. My daughter still prefers milk straight from the tap. AKA me. She nurses much more vigorously when I’m home. This is her personality and how she prefers to eat. Your baby’s eating and sleeping patterns may be unique to him. 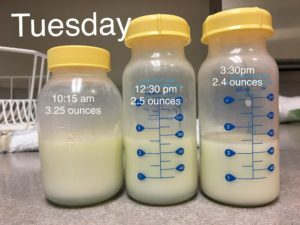 You may pump more during the day if your baby eats more at each setting.